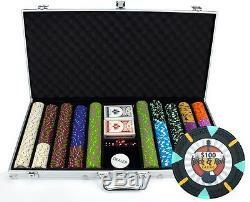 This is the 750 Ct "Rock & Roll" clay composite poker chip set from Claysmith Gaming in an aluminum case. This set includes 750 of the finest casino grade clay composite poker chips, a free dealer button, 5 dice and 3 decks of playing cards. Claysmith offers true casino quality poker chips for the home player. The Rock & Roll inlay is set upon a Claysmith Gaming "gear wheel" molded poker chip. The Rock & Roll has four triangular edge spots surrounded by stick and edge markings. The Rock & Roll inlay uses a detailed design that prominently features the chip denomination, along with dollar sign, at top. Underneath that, the words "Rock & Roll" are spelled out over a red and orange logo designed to look like a guitar. Each chip weighs approximately 13.5 grams. This chip is part of the ClaySmith Casino Clay line. This poker chip is of the highest quality and is casino quality by any standard. This clay poker chip uses compression molding techniques to achieve its professional look and feel About the Brand: Claysmith Gaming is synonymous with poker quality. Claysmith brings casino aestheticism with fresh new designs to your home game. Claysmith poker chips feel and look substantial, which enhances your playing experience. Most home use poker chips are just a component of the game. Claysmith chips are a part of the enjoyment of the game. Players are excited when they hear that you will be playing with Claysmith chips in your poker game. You will be proud when you set them on your table. Claysmith has analyzed thousands of poker chips over the history of casino gaming to arrive at their own edgy designs. For a poker chip to be interesting they need to look legitimate and tell a story. Every poker chip that Claysmith has produced garners a little bit of Las Vegas style and exhibits a fresh look at the history of gaming. Claysmith chips are superior for four reasons: Inlays, Edge Spots, Molds and Materials. Inlays Claysmith prefers interesting inlay designs and avoids adding just another boring poker chip to the market. Inlay design is the most important component of the manufacturing process and each chip is designed by a team of artists. Claysmith ensures that every inlay design employs cutting edge techniques and that each chip appears as if it could have come direct from the casino floor. Every inlay tells a story and evokes a feeling of nostalgia. Edge Spots Claysmith employs a four color approach to their poker chips. Each poker chip has a base color and three accent colors used on the edge spot. 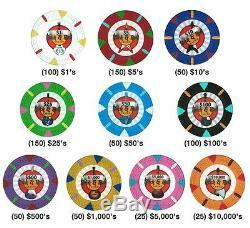 All poker chips use a different color scheme. This process yields an exciting and wonderful array of colors on your poker table. The edge spots are also unique and exciting. Claysmith avoids using the simple 8 stripe approach or a boring dual colored rectangle when designing the chip edge spots. Triangles, tri stripes, quadrangles and multi colors rectangles are all apart of Claysmith gaming's edge spot arsenal. Molds Claysmith Gaming has designed unique and interesting molds that create an engraved impression (known as mold marks) around the chip. Claysmith chips are not simply boring flat smooth discs. The mold marks provide the chip with an identity even before you place the inlay. Casinos use a mold mark for security and branding. If your chips do not have mold marks, then they will not look or feel authentic. Mold markings give a poker chip texture, security and aestheticism. Mold markings give Claysmith poker chips a personality. Materials Claysmith uses the finest clays and composite materials during the production process. Only casino quality raw materials are used in their molds. Not only do the chips look like they have come off the casino floor, but they feel authentic. The item "750 ct Rock & Roll 13.5 Gram Casino Grade Poker Chip Set Aluminum Case" is in sale since Thursday, January 19, 2017. This item is in the category "Collectibles\Casino\Chips\Poker Chips". The seller is "shopilee" and is located in Greenfield, Indiana. This item can be shipped to United States.